We're about to spend a lot more time together. Five days before President Barack Obama makes his historic trip to Havana, his administration is making it easier for the rest of us to travel there, too. On Tuesday, the White House announced that it would allow “people-to-people” educational trips, meaning that travelers no longer have to go in restricted and expensive group tours. The U.S. will also ease limits on the use of American dollars in Cuba and let U.S. banks process Cuban government transactions. That means it’ll be easier for Cubans to make money in the U.S. The new rules take effect on Wednesday. Enacted by the Departments of Treasury and Commerce, these are the most significant regulatory steps so far on the path that Obama and Cuban president Raúl Castro laid out in December toward normalizing relations. 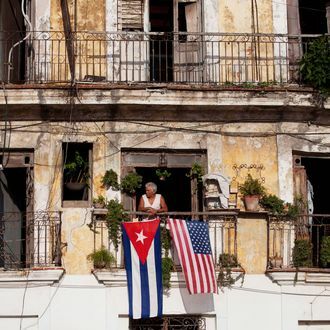 Americans hoping to travel to Cuba will still have to affirm that they are traveling only for educational purposes (the “tourism ban” part of the embargo is still technically in effect).